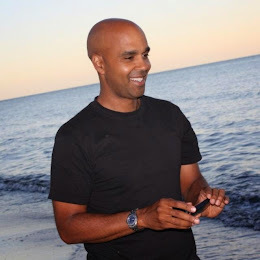 In the midst of beginning this article last week, I had a business trip outside of Stockholm. When I checked into the 300 room hotel, I was given room number 911 which at first felt a bit eery but I quickly realized it was the little push I needed. Inspiration happens when you least expect it and I felt that mini jolt! I finished my story (below) about one of America's darkest days later that evening. In the late afternoon of Sept 10, 2001, I was not far (financial district) from the World Trade Center (Twin Towers) attending a charity event for my former employer, a respected non-profit organization based in Virginia. After finishing, I called a cab to take me home. As I was waiting in the early evening, the sky became ominous and a downpour of rain began that was treacherous. I don't think many remember this night because of what happened the next day but it was one of the most chilling few hours of rain and sky I have ever experienced. If you believe in signs, this could have been a sign of what was to occur in a little over 12 hours. Traffic was unbearable and the normal 20 minute cab ride took close to 2 hours. Although quite exhausted, I was happy to arrive at our Brooklyn apartment. Sept 11, 2001 started as any other morning. My girlfriend (now wife), arrived at her work in midtown Manhattan around 8am. I was leisurely watching the Today morning show at home when it was interrupted by "breaking news". I, like millions of viewers were told that a small plane had hit one of the Twin Towers. Immediately, I thought "how strange" and didn't really think much of it even after seeing the hole in the tower which didn't appear that large as the shots were from a distance. Not long after, I knew something terrible was happening when I saw on TV, a fireball explosion of immense intensity in the other tower. As we now know, that was the next airplane hitting the 2nd tower, a scene that was played over and over during the morning and is as horrific to watch now as it was then. Sometime during the morning chaos, I made sure to contact my girlfriend and was relieved that she was okay. She wasn't able to get home until late that night (stayed with a close friend) as the subway system was shut down. I called my uncle and aunt who lived in Tri-beca (first plane flew low over their apartment) to find out how they were coping and they were rattled but fine. I was preparing for a presentation about my charity that morning but it was evident that no work was to be done on this day. I sat glued to the TV, never expecting the horror that occurred later that morning. One Tower fell and the sadness in my heart for all those souls in the building was excruciating. I become choked up. Then the next tower fell, and that was the moment I knew America and our world would never be the same again. Before the towers fell, my ex roommate who lived in Chicago at the time was visiting his office at 7 World Trade Center (the third building to collapse around 5pm). He escaped not long before the towers fell with many of his colleagues, but what he witnessed upon exiting changed his life forever. He saw over ten people jumping from the burning towers. He really hadn't intended to watch them but he admitted being mesmerized by what he was witnessing. He came over to our home a few days later to tell us all about it and he couldn't fight the tears. The subject came up on his visit to Stockholm in 2006, and once again he wasn't able to control the sadness and tears that he will most likely carry forever. Around noon, I wanted to do my part to help on this unimaginable day. Not knowing what that would be, I strolled down to the Manhattan Bridge which was nearby. I could see thick smoke rising (picture above). 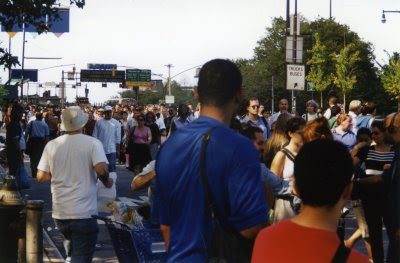 Thousands of people were walking across the bridge to Brooklyn as this was the best way to get home as everything in Manhattan was shut down. The crowds walking across weren't that big but I knew they would increase rapidly. The following days seemed to be numb for everyone as we were inundated with coverage of Sept 11 and the personal stories attached to it. One comforting factor was the Mayor of New York City (NYC), Rudy Giuliani. Even though many were not happy with the pitbull manner in which he ran NYC, he was no less than brilliant in his handling of news conferences and simply comforting the millions of people in NYC. He was a huge reason the Big Apple was able to handle this tragedy with dignity and bounce back. One way Giuliani helped to improve the psyche of New Yorkers was to urge people to get back to life as normal. He implored us to go to restaurants, plays, etc as a way to start the restoration and show the terrorists that life in NYC will go on. My girlfriend and I were inspired to do our part and within a week got tickets for the play Chicago. Tickets were half price and we had the best seats in the house! One of the cast members thanked the entire audience after the show in such a heartfelt way which was touching as you could tell she was appreciative of everyone coming out. Exiting the show , I remember smelling the awful stench of the building's ashes/ disintegrated bodies even from 50 blocks away. It was a poignant reminder of what had happened to what I felt was and still is the best city in the world. Two weeks after, I had a charity event near the wreckage which was terribly difficult to navigate to as the cleanup was still in its beginning. Rolling my bag along the street, I looked up and saw from 3 blocks away, the destruction remaining from the falling towers. It was an unreal site even from that distance. The jagged steel was an imposing and frightening picture to witness. I am happy I was blocks away as I cannot imagine what it would have been like to see it up close. 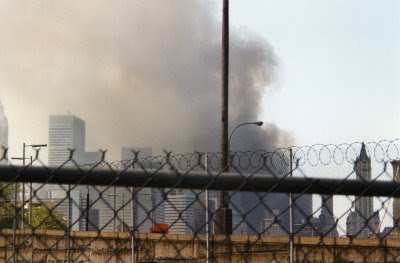 Every so often, I think of those who died in the buildings (NYC and the Pentagon) or in the air, were injured, or became sick after helping in the search and clean up of what came to be known as Ground Zero. We can also never forget the policeman, fireman, military personal, and volunteers who played a huge part in saving lives with their selfless and heroic efforts. More heroism blossomed after I read a story about a Vice President (VP) in the second tower hit who helped to direct her firm's employees and visitors into the elevators to safety. That VP was my client and was instrumental in helping my non-profit become a preferred charity in their philanthropic efforts. She was a kind and personable woman and showed her loving nature when she put other's safety ahead of her own. After she helped her crowd to safety, she was planning to exit but the 2nd plane hit. She never made it out. I can only hope that I would have showed the same compassion if I had been in her place. Many people were fortunate to be absent from their job on that fateful morning for a variety of reasons. One of those absentees was a member of my gym. He worked for the firm Cantor Fitzgerald which lost the majority (over 600) of their employees that day. He was playing in his weekly Tuesday morning basketball game which didn't end until 8am. He was on his way to work when the first plane hit. I wanted to ask him how he felt to be alive but the moment never felt right. Two of his colleagues (nice guys) who often played basketball with me at the gym were in the office that morning and never came home. Fortune smiles on some and frowns on others. One disappointment from this day was the fact that I had friends who live in America outside of NYC who STILL have not asked me about that day even though they knew I was there. Some never called to see if I was okay! I actually got many more international inquiries about my well being. I found it strange and discomforting at the time but later realized that many either couldn't relate because they lived outside or really didn't care as they always saw NYC as a risky place where there is always a chance of terrible things happening. The first two years after 9-11 were tough as it took some time for NYC to rise again and for people to get over the enormity of what had happened. I left NYC in 2004 and by that time, it was back in full bloom and better than ever. A big part of that feeling came from current Mayor Michael Bloomberg who came into power in 2002 and has proven to be a dedicated and successful Mayor. In the times I have returned in the last 4 years, the Big Apple was fabulous each and every time. The spirit of that great city has never been better. One thing we have to remember is that this is not the end of American pain as there will be more terrorist acts in America's future. Let's hope it never gets worse than 2001 but we must always be ready and never get too complacent as a nation. We still have to live life, volunteer and embrace diversity which will help us continue to have fun, improve as individuals and learn about and care for different cultures. Livet är bra (Life is good) as I say almost daily. Embrace life each and every day. A stranger who helped me pour and hand water to the crowd on 9-11. 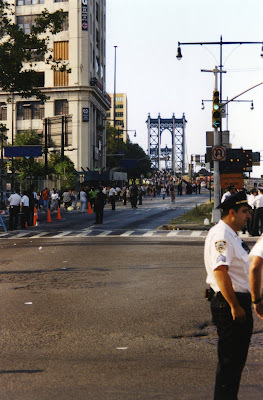 Leaving the Manhattan Bridge after a long afternoon on Sept 11, 2001. Wow George! It's 7 years later and your article made me recall feelings that I must have suppressed since that awful day. I never realized that you had taken photos. Would love to see more if you have them. Very, very good piece George. While I may not agree with all of your assessments, you certainly hit the ball out of the park with your vivid descriptions. You just about brought me to tears again. I especially liked your dig at some capitalists. Capitalism is a great system that is too often dominated by a few wretched souls. Or is that a few souless wretches? Either way, it was good to see you and other decent, like-minded people seize the day and allow compassion to conquer commercialism. And like Teddy, I didn't know about your pix and would like to see more. Really wonderful piece and I can hardly wait to talk to you again so we discuss this in more detail. Peace and blessings to you and yours. 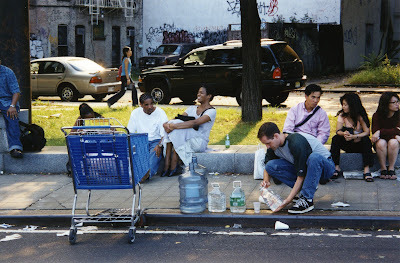 Reading this blog ten years later, I can still feel your compassion and desire to help your fellow neighbor. I am reminded of that sense of brotherhood and love that grew from this tragic experience and pray that it will reignite in all of us. I pray for peace for the family and friends of all those who perished or were injured. I remember and honor those loving Spirits who continue to demonstrate God's love to all of us that remain in this earthly realm. I am touched an silenced by your beautifully written article. Tomorrow will be 11 years since that horrible day. May we always remember and always live our lives with purpose and compassion. Thanks, George, for the link on FB to this blog entry. It is so powerful and takes me right back. It is such a good exercise to keep reading these examples of how we pull together when a crisis calls for it. I only wish our best inclinations were readily available on a more frequent basis. This day is a reminder of what is so horrid and so beautiful about being human. Mistakes - Responsible or Irresponsible?